PISCATAWAY, New Jersey (WABC) -- The Scarlet Knights improved to 4-5 on the season, and winners of their last three of four. 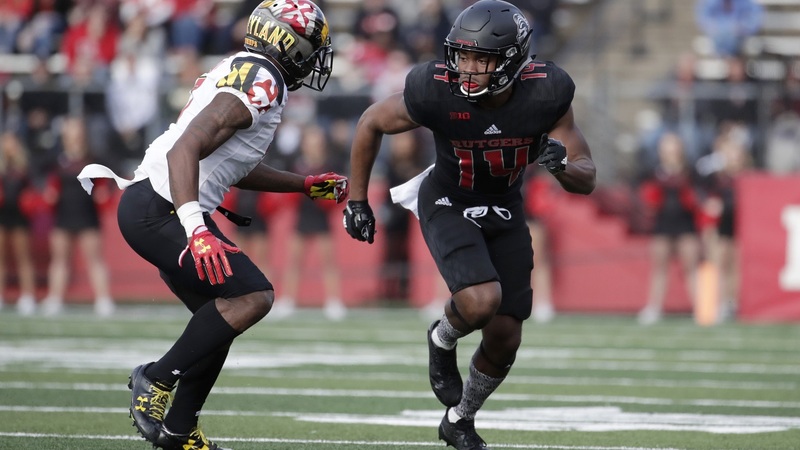 On Saturday, Rutgers defeated Maryland 31-24 at High Point Solutions Stadium in Piscataway. After the victory, head coach Chris Ash said; "This was a big game for us." Ash added; "It's one that we needed, and they worked really hard. We knew it was going to be hard, it was going to be a four quarter game." Rutgers blew a 17-7 lead in this contest, and it could have proved costly trailing 24-17 late. Just as the head coach stressed, it was a four quarter game. Evident so by the late game winning drive put together by the offensive line, and quarterback Giovanni Rescigno. Midway through the fourth quarter Rescigno capped off a 11 play, 65 yard drive with a 23 yard pass to Gus Edwards to give the Scarlet Knights the lead. This game was not without its controversies. Rutgers was called for an offside penalty in the 3rd quarter. The replay clearly shows Maryland's tight end moved before the snap on a crucial 4th and 1. Head coach Chris Ash didn't need a re-play to see that, and was very animated on the sidelines. As a result of the blown call, the defense held its ground holding Maryland to a field goal giving the Terps a 24-17 lead. However it was Rutgers that would be the final benefactor of a missed call. This came on Maryland's 4th down play with less than a minute remaining in the end zone, sealing the victory for the Scarlet Knights. The Rutgers defense would also get into the action today. In the 2nd quarter, Kiy Hester had a 52 yard interception returned for a touchdown. That gave Rutgers a 17-7 lead before Maryland answered back with three straight scores over two quarters. It was the fourth quarter where this team finished strong. Indicative of a potent 4th quarter, and Robert Martin's 10 yard touchdown run that preceded Edwards touchdown grab. Chris Ash said afterwards; "We're going to have to make plays at the end, on either side or either phase. We did that, and came out with the victory." This game was originally scheduled to be played at Yankee Stadium, but because of the Yankees playoff run it had to be moved to High Point Solutions Stadium. On Saturday, the home crowd was treated to a strong performance by their Scarlet Knights. Next up, a tough opponent as Rutgers takes on Penn State in Happy Valley at noon. Starting play on Saturday, Penn State was ranked #7.